I did not know FickleMinded Blog but I am glad she give me this award. 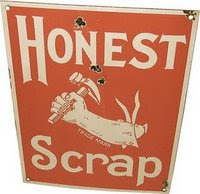 Thank you very much for the Honest Scrap award that you give. It impresses me because even you did not even know me still you choose to give this to me. Thanks again. -Choose a minimum of 7 blogs that you find brilliant in content or design. Or improvise by including bloggers who have no idea who you are. -List at least ten honest things about yourself. Then, pass it on! 1. I will start with my college also... i am a working student in college for 8 solid years but did not finished because i got married and after processing my visa I flew here in America. 3. I am a collector of spoons and little glasses in different states ( wherever i go i collect 1 spoon for every state ) so far i already collected more than 10 states already. 4. I love eating rice and i can't live without it. 7. I experienced working as an assistant dean and few year i experienced being a dean of college students. I know you will be surprise but thanks for visiting my blog and I want to know you and be my friends online. thanks for the effort, it's nice to know a few things about you, and we have one thing in common, I also collected those little State shot glass bec we too love to travel.